BTC/USD has lost 5% on a daily basis amid strong sell-off. SEC's decision to postpone the verdict until September 30 worsened market sentiments. Bitcoin attempted a short-lived recovery on Tuesday, but bulls' hopes for recovery were ruined by SEC's decision to postpone a verdict for VanEck, the first bitcoin-related exchange-traded-fund. The digital coin No.1 is changing hands at $6,580 at the time of writing, down nearly 5% since this time yesterday and almost 2% since the beginning of Wednesday. According to the notice, published by SEC, the regulator received over 1,300 comments on the proposed changes to the effective rules, which will allow to list and trade shares issued by VanEck SolidX Bitcoin Trust. “Accordingly, the Commission, pursuant to Section 19(b)(2) of the Act,6 designates September 30, 2018, as the date by which the Commission shall either approve or disapprove, or institute proceedings to determine whether to disapprove, the proposed rule change (File No. SRCboeBZX-2018-040),” the document goes. Initially, the decision was supposed to be announced on August 10. The delay discouraged Bitcoin traders and triggered massive sell-off, intensified by the breakthrough below technically essential levels. 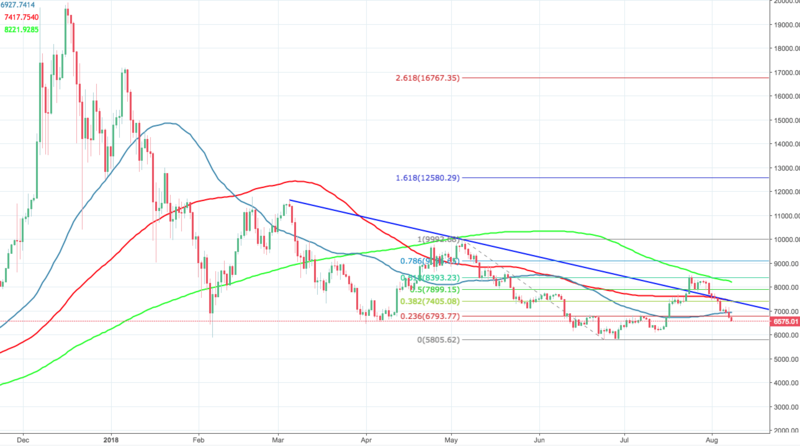 Technically, BTC/USD is trading below both 50-DMA and 23.6% Fibo retracement level of the upside movement from $5,800 to $10,000. This is a bearish signal, which means that more downside may be in store with the first technical aim at $6,400 created by Pivot Point one-month Support 1. If it is cleared, 6,000 will come into focus. It is worth noting that there are few support levels on the way down, making it the path of least resistance.